Maria C. R. Harrington, Ph.D. Figure 1: Video of The Virtual UCF Arboretum Virtual Nature Model and Educational Simulation, credits: The Harrington Lab, UCF, 2018. The Virtual UCF Arboretum project (2016 – present) is a Virtual Nature model annotated to work as an educational simulation. Constructed as a large open world, using sparse GIS data sets required for information fusion and domain expertise to achieve accuracy and realism, the data are visualized with photorealistic accuracy to match the real environment. The ambient bioacoustics are accurate representations of insects, amphibians, and birds found in the environment. All photorealistic 3D plant models are botanically correct, and each is dispersed using actual plant population data to simulate realistic dispersion and densities. The 100 hectare (247 acres) virtual model was constructed in the Unreal game engine. The virtual environment is unique because it integrates a complementary website with a digital media plant atlas that includes facts and concepts, which allows individual users to pursue deeper inquiry at the moment of personal encounter and curiosity. The Virtual UCF Arboretum project is an augmented reality (AR) and virtual reality (VR) collaboration between The Harrington Lab, the Nicholson School of Communication and Media, in the College of Arts and Humanities, and the UCF Arboretum, Landscape and Natural Resources in the Department of Biology, in the College of Sciences, at the University of Central Florida. 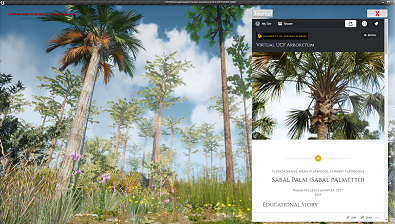 Figure 2: The Virtual UCF Arboretum, demonstrating VR and website integration, credits: The Harrington Lab, UCF, 2018. Figure 3: Left: concept of a VR wall installation. 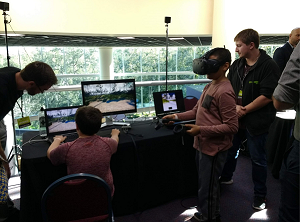 Right: The Virtual UCF Arboretum, VR desktop and HTC Vive demonstration, credits: The Harrington Lab, UCF, 2018. Launched in the fall of 2016, photographs and video of the real UCF Arboretum were gathered in this wild and beautiful place on the university campus. The project's mission is to provide beautiful and accurate educational material on plants and wildflowers in Florida to schools and to the public free of charge, and as a research and system development effort to inform best practices in digital media design for educational impact. More broadly envisioned, this research program aims are to investigate truth and beauty through art and science and on the human and cultural transformations made possible with the execution of accurate data visualizations of virtual nature in real time interactive game engines and sparse GIS data sets. In the spring of 2017, undergraduate students joined the multidisciplinary effort as Undergraduate Research Assistants in The Harrington Lab, to help build the digital media. Work started on building the website and the 3D models for use in augmented and virtual reality educational applications. A major deliverable is the ability to use all of the models with inexpensive VR headsets, such as Google Cardboard (https://vr.google.com/cardboard/) and most smartphones for educational lessons, anywhere and anytime, some now with AR technology. Many of the models may be viewed in AR smartphones. The models allowed the Unreal Engine team to build and deliver a large open world model on AWS, based on GIS data of plant populations and locations representative of the real UCF Arboretum. The first prototype was demonstrated at the NASA Young Investigators Workshop, January 2018, in Galveston, TX. Over the summer of 2018, the team continued to refine and develop optimized 3D plant models for large open environments, and worked on VR tests and probes for the light weight AR plant models required for use in the field. The open world model is an information fusion of sparse GIS data, terrain data, plant population data sets from field work of the UCF Arboretum, drone images, and accurate plant models, all used to simulate the 100 hectare (247 acres) virtual model of the real UCR Arboretum. The model was constructed in the Unreal Game Engine to run at acceptable FPS levels. Programing and integration of the Unreal model with the website was completed in the fall of 2018 to support learning at points of interest, linking all 35 plants in the game engine to the educational facts and concepts on the website. Thus, combining a photorealistic, high fidelity, 3D botanically correct plant models, with accurate environmental information data sets to create an accurate virtual nature environment, a Virtual Nature model for use in for art, research, and education. Artistic refinement of details was achieved through visual inspection of photographs to bring the model to life. Ambient life, such as butterflies, dragonflies, fish, and American Bald Eagles complete the model. The textures for the insects were kindly provided by the UCF Bug Closet. 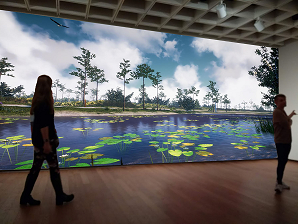 The Harrington Lab at UCF investigates virtual nature, using AR and VR as a technical artifact, to better understand perceptual phenomenon as it relates to human-computing-environment interactions that cause emotional, learning, and aesthetic outcomes. The lab is highly collaborative with several active multidisciplinary partnerships. Broader impacts extend educational opportunities, in paid positions as Undergraduate Research Assistants, mentorship and learning, paid internships with non-profit partners, and development of portfolios to support future career objectives in job searches and graduate school applications. Efforts focus on extending prior work in the development of Simulated Ecological Environments for Education (SEEEs) used for research and art. The lab is under the direction of Dr. Harrington at the University of Central Florida. James Miller: Undergraduate Research Assistant: Lead Developer and Programmer, Unreal Engine, January 2018 – Present. Thomas Pring: Undergraduate Research Assistant: Programmer, Unreal Engine, HTC VIVE, January 2018 – Present. Kellie Beck: Undergraduate Research Assistant: Arboretum Content Liaison, Graphic Designer, and Website and WordPress Developer, (January 2016 – August 2018). Jeremy Blake: Undergraduate Research Assistant, Environmental Artist, 3D Artist, Modeler, Unreal Engine Art. (October 2017– May 2018). Bailey Estelle: Undergraduate Research Assistant, Environmental Artist, 3D Artist, Modeler, Unreal Engine Art. (October 2017 – May 2018). Sebastian Hyde: Undergraduate Research Assistant, Environmental Artist, 3D Artist, Modeler, Unreal Engine Art, (October 2017 – December 2017). Aubri White: Undergraduate Research Assistant, Environmental Artist, 3D Artist, (October 2017 – December 2017). My warmest thanks to the entire group, Patrick Bohlen the UCF Director of Landscape and Natural Resources and Arboretum, Jennifer Elliott the Assistant Director, Raymond Jarrett, one of the most knowledgeable botanists and biologists I know, Amanda Lindsay a biologist with amazing knowledge, foresight and initiative, and John Guziejka a biologist with a gift for fun and informative interpretive narratives. In the fall of 2016, we gathered over 50 GB of field data on over 36 native local plants, and over 20 video narratives on site with their help. All 3D plant models were vetted and approved by the botanists and all environmental data sets were provided by this magnificent team. 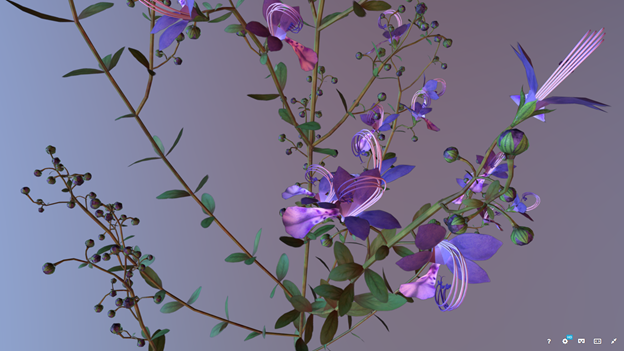 Figure 4: VR 3D Model of the Forked Blue Curl (Trichostema dichotomum), 3D artist credit: Katherine Ryschkewitsch.